In a fresh approach to green advertising, the beverage giant and the World Wildlife Fund have set up a new 60′ x 60′ billboard in the Philippines that’s covered with Fukien tea plants which absorb air pollution. Tim Nudd at Adweek gave all of the details about this environmentally friendly foliage display. 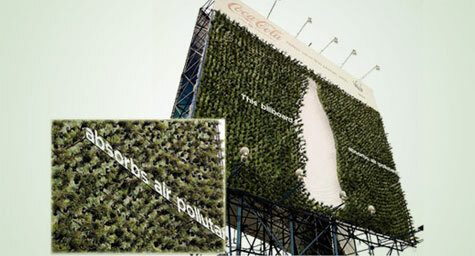 “This billboard helps alleviate air pollution within its proximate areas as it can absorb a total of 46,800 pounds of carbon dioxide from the atmosphere, on estimate,” says botanist Anthony Gao. In addition to the Fukien tea plants, the rest of the billboard is also built to be green. The plants are potted in 3,600 containers made from old Coke bottles, the potting mixture is comprised of organic fertilizers and industrial byproducts, and a drip irrigation system saves water and fertilizer by allowing water to drip slowly to the roots of plants. The billboard is being touted as a symbol of the Philippines’ commitment to incorporating sustainability into daily life to make a positive difference in the world. Overall, it’s a refreshing way to show the beauty of going green.